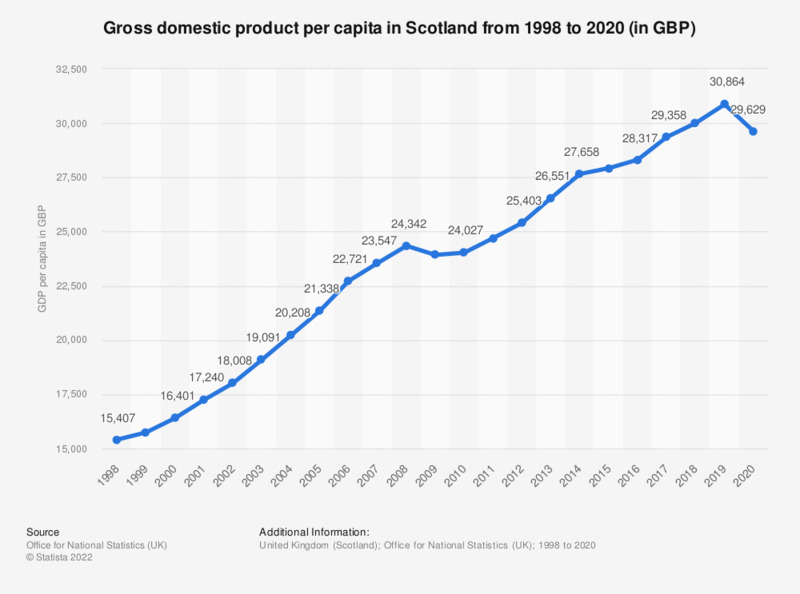 This statistic shows the value of gross domestic product (GDP) per capita at current prices in Scotland from 2000 to 2017. From 2000 to 2008 the gross domestic product at current prices increased each year. There was a decrease in 2009 and 2010, this was almost certainly due to the effect of the global financial crisis on the market value of all final goods and services produced in Scotland in that year, yet from 2010 Scottish GDP almost fully recovered, growth of GDP per head increased annually thereafter. A very similar trend can be seen in the development of annual GDP at market prices and annual GDP excluding North Sea revenue. Quarterly GDP at current market prices is also available as well as quarterly GDP per capita.